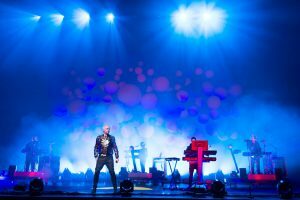 No group has bridged the electronic disco and pop worlds as effectively – and for as long – as the Pet Shop Boys. We spoke with Lowe, who writes most of the music and does the duos programming (Tennant handles most of the lyrics and singing) by phone from London. HERALD: When you first broke through, there was a feeling that your sound might prove to be ephemeral. Now Pet Shop Boys seem timeless. Any idea why? CHRIS LOWE: (Laughs) Maybe people just love us. We like to think that its the songs. What weve always tried to do is write interesting songs that say things that dont normally appear in pop music, put them to contemporary dance beats and have an emotional content as well. And we set things to chord progressions that we like. Weve never lost our fascination with pop, in all its forms – the arts, clothes, music, fashion. We still go clubbing, even though were old. We never retired. We never went to a country and switched off. We always stayed in the center of things. We both live in London still. Were still fascinated by life. HERALD: Youve created your own musical universe over the past quarter-century. CHRIS LOWE: From the very beginning we wanted to create our own world. We didnt want to exist in anyone elses. Were obviously influenced heavily by electronic disco music of the 80s. I remember hearing Donna Summer in a club and I was completely knocked out. It was so new, so exciting. But thats only an element of Pet Shop Boys. With the songwriting, weve always stayed away from cliches and tried to present ourselves uniquely. One thing we love about pop is it changes. Its not about the past. Its about the next thing. HERALD: You use synthesizers and computers, while shunning traditional rock instrumentation. On your 1992 tour, your backing musicians were hidden offstage. CHRIS LOWE: Wed been told that to tour America you have to have a drummer. So our answer to that was, Right, if thats the case, were not going to have any musicians (onstage). If someone tells us to do something, well do the opposite. All the music was generated offstage and we put on a totally operatic performance. I dont think anyone had actually done that. A lot of rock musicians cant get their head around modern technology. Unless they can see someone playing guitar, they dont know how its being made. Theres the whole thing about authenticity as well, that its not authentic unless someones standing in front of an amp with a guitar and theres a drummer banging away. We didnt make records with a drummer. So, it wouldnt be authentic for the Pet Shop Boys to have a drummer. We were actually being authentic. Also, we wanted to put on a visually stunning show. We lost a fortune doing it. We got a review in New York saying the theater (we played) should be fumigated. I think they found the show quite offensive. HERALD: For this tour, any musicians? CHRIS LOWE: No. Well, Im playing. Its almost like a DJ stand, if you like. We realized no one can actually see what Im doing, so I might as well not be doing anything, but I am actually playing. Offstage, we have our musical director and the usual computers. I think people would be disappointed to come to the Pet Shop Boys and not hear synthesizers and electronics. You dont want an acoustic set from the Pet Shop Boys. HERALD: I dont know anyone who mixes desperation and hope, melancholy and uplift, so well. Yes is mostly a positive album, but you do close with Legacy, where there are melting glaciers, failing governments and bawling hurricanes. CHRIS LOWE: Well, you cant have it be happy all the way. I think we straddle optimism and pessimism. We always expect the worst, but we are optimistic as well. Although we like to say we do euphoric pop, its always tinged with sadness. And I think reality is the combination of those two. We like banging beats and rhythms, but we like to put minor chords on top of it and thats where the tension comes. Theres a realism in what we do. HERALD: You get called post-modern ironists a lot. CHRIS LOWE: Oh, thats one thing, actually, that does bug us – the irony tag. We have done ironic things, but you cant dismiss everything weve done as ironic. Theres a lot more to it than that. Going back to Legacy, theres no irony. Theres no irony in Love, etc. Sometimes people confuse winks with irony. The payoff line in Love, etc. is: You dont have to be beautiful – but it helps. And its also true. CHRIS LOWE: Well, weve never hidden anything. There was never any pretense in what we do. We covered Go West by the Village People. Weve never actually thought there was the need to be explicit about anything. We dont like to be political and we dont make political statements. Everything is in the music and you can get it if you want it. Were just awkward bastards, really. HERALD: PETA recently requested you change your name to the Rescue Shelter Boys, because of the cramped, filthy conditions that breeders keep animals in before selling them to pet stores. CHRIS LOWE: We dont know how serious that was. We still dont know. But I think it was good because it drew attention to pet shops. Thats why we highlighted it on our Web site. We thought it was a point worth making. Id never really given a thought to the welfare of the animals in pet shops. Itd be a good pseudonym to work with, for the more underground end of what we do. HERALD: The name came about because you had friends working in pet shops, right? CHRIS LOWE: They did exist. They were referred to as the pet shop boys and we needed a name. There were loads of boys groups – the Beach Boys, the Beastie Boys – and we thought Pet Shop Boys. Initially we thought, No, its a bit silly, isnt it? But then we couldnt think of anything better. Now, you just have to deal with the fact that youre old and youve still got Boys in the title.